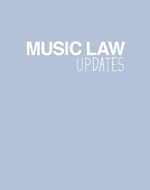 COPYRIGHT Music Publishing Ludlow Music Inc v JibJab: In The September Law Updates we reported on the case being brought by Ludlow Music against JibJab over the unauthorised use of the song ‘This Land’ in a piece of flash animation. Jibjab were raising the defence of ‘fair dealing’. The Electronic Frontiers Foundation backed Jibjab and provided research that showed that the piece had fallen into the Public Domain and a ‘re-registration’ of the title in 1984 was ineffective as the copyright expired in 1973, 28 years after first publication in 1945. Fred von Lohmann, EFF Senior Intellectual Property Attorney said: JibJab’s fantastic animation is a clear fair use of Woody Guthrie’s “This Land Is Your Land,” for the reasons described in detail in EFF’s initial letter to Ludlow’s attorney. But also important was our other discovery: the Guthrie classic has been in the public domain since 1973. Fact 1: Guthrie wrote the song in 1940. At that time, the term of copyright was 28 years, renewable once for an additional 28 years. Under the relevant law, the copyright term for a song begins when the song is published as sheet music. (Just performing it is not enough to trigger the clock. )….